HLAA announced last month …. “We don’t make changes cavalierly here at HLAA, so when we do, it’s with the vision of looking forward, keeping up with the times, and bringing you the most reliable and timely information. We take our mission of providing information, education, support and advocacy very seriously. But with changes in the market, technology innovation, and with person-centered care being the trend du jour, HLAA is leading the way. Along with a new name and fresh look for the magazine and a completely redesigned website, there was something else to consider. It became very clear, very fast that we needed a new logo for our organization. The name is the same, Hearing Loss Association of America, but we felt our logo didn’t sufficiently represent the HLAA brand as we go forward. The new HLAA logo focuses on people – it’s personal, positive, contemporary, welcoming, and represents growth. It was designed to be unique (just like HLAA!) and set us apart. In addition, we have become well known by our acronym – “HLAA” – and the new logo reflects that name recognition. But one thing we did not change was the color palette as we wanted to make sure there was some consistency carried through. People will see different things when they look at it, and that’s a good thing, because we represent different things to different people. 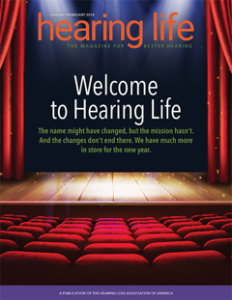 Hearing Life, the new name of HLAA’s premier publication, previously Hearing Loss Magazine. Hearing Life is about you – the person at the center of your own care. It’s about learning all you can about hearing loss and getting better access to communication and then making your own choices about what works for you. We know that untreated hearing loss can lead to isolation, depression, anxiety, falls and maybe cognitive function. Communication – being engaged with others – is what makes life worth living”. Skinner Cheng, Pieter Doevendans and Thibault Duchemin were named by Forbes Magazine as Consumer Technology ”30 under 30” achievers. Chapter members who have attended the HLAA Convention know them as the Dutch and French inventors of AVA. Many Chapter members have Beta tested their real-time captioning technology to carry on conversations in a noisy restaurant. 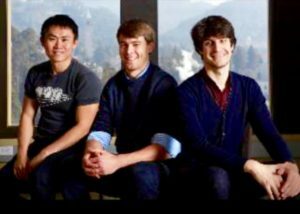 “Berkeley, Calif.-based AVA makes a mobile tool to convert conversations into text for hearing-impaired individuals. The app takes in conversations through a phone’s microphone and works to transcribe that into readable text. CEO Duchemin grew up as the only person that could hear in an all-deaf family and the company originally set out to build smart gloves to translate sign language. They needed to develop a technology that was culturally adapted and very accurate. For over a year, they spoke with more than 300 audiologists, deaf individuals and speech and behavioral design experts to redesign the perfect solution. During this process, they met Skinner Cheng, a University of San Francisco computer science graduate student who is deaf – who brought an even deeper understanding of the communications issues facing this community. AVA is available as an Android or Apple App for a mobile phone. 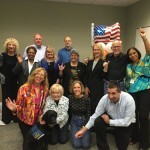 HLAA-FL State Newsletter – Hearing Loss? Let’s Connect! HLAA Florida Chapters – Click here!